We all love our days at the Disney Parks, but sometimes you just need to get away from the craziness. I often have to remind myself to slow down, take a break and relax. Otherwise, you could exhaust yourself before your day or your vacation is over. 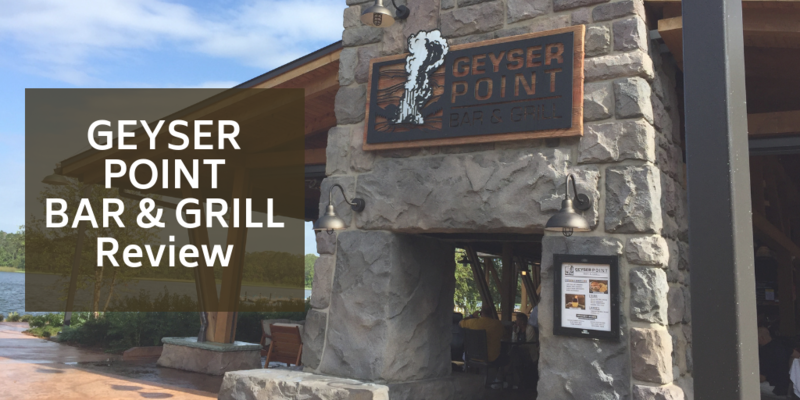 Thankfully, there are many options for taking a breather, and one of those is Geyser Point Bar & Grill! 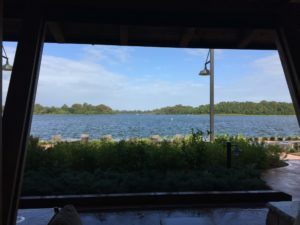 If you are spending the day at Magic Kingdom, I’d suggest hopping on a resort boat and taking a nice relaxing boat ride to Disney’s Wilderness Lodge! 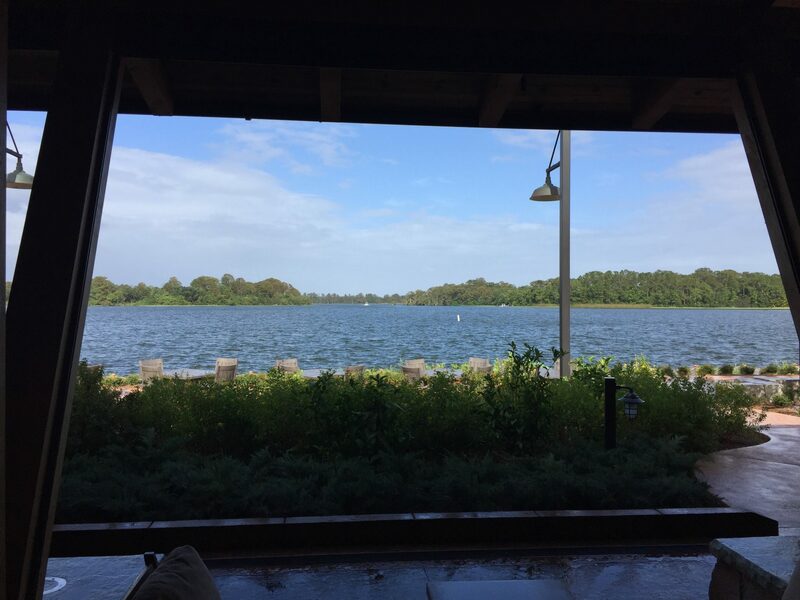 I love Disney’s Wilderness Lodge, mostly because of its relaxing woodsy vibe. The Wilderness Lodge also offers some great dinning options like the quick service restaurant Geyser Point Bar & Grill. 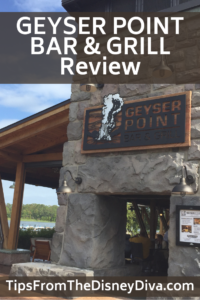 Geyser Point Bar & Grill is a covered but open are quick service restaurant right next to the water and is very relaxing and laid back. This isn’t fine dinning but it’s a great place to grab a drink or a sandwich and just breath. 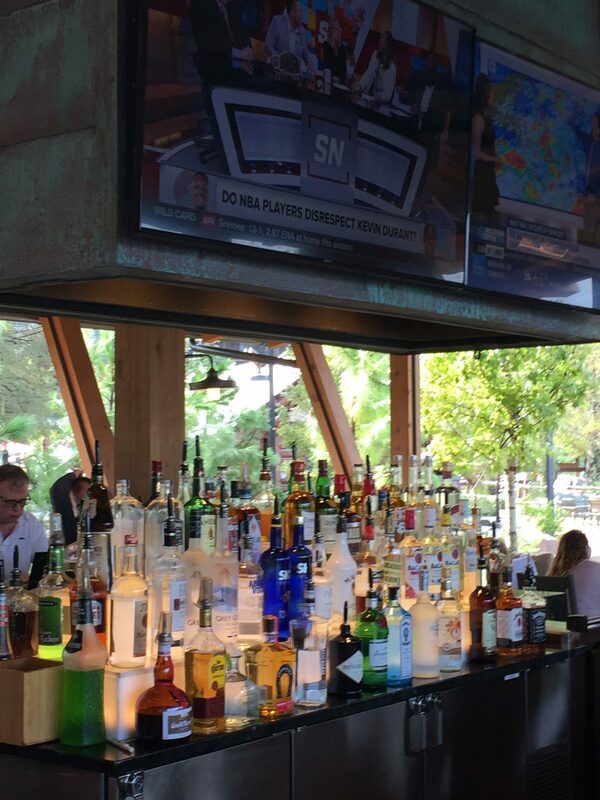 They do accept the Disney Dining Plan and will cost you one quick service credit per person. Don’t want to sit down and eat? There’s also a take out window which accepts the dining plan and has a mug refill station. Sandwiches and salads will cost you between $8.99 and $14. 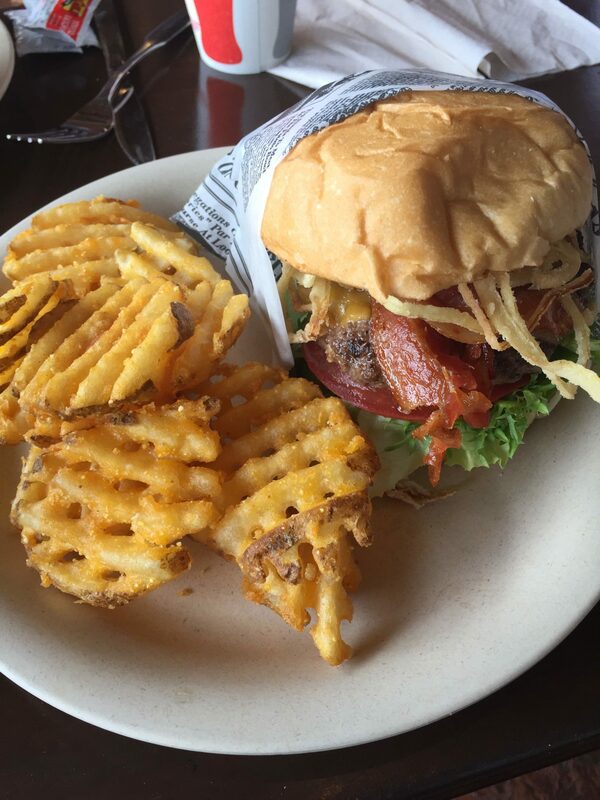 We went with the Bison Cheeseburger served on an artisan roll with bacon, Tillamook cheddar, onion straws, lettuce, tomatoes, garlic aioli and marionberry barbecue sauce served with waffle fries. The bison burger was cooked perfectly and was quite tasty. 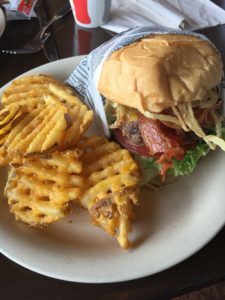 This was probably the best burger I’ve had at Walt Disney World! 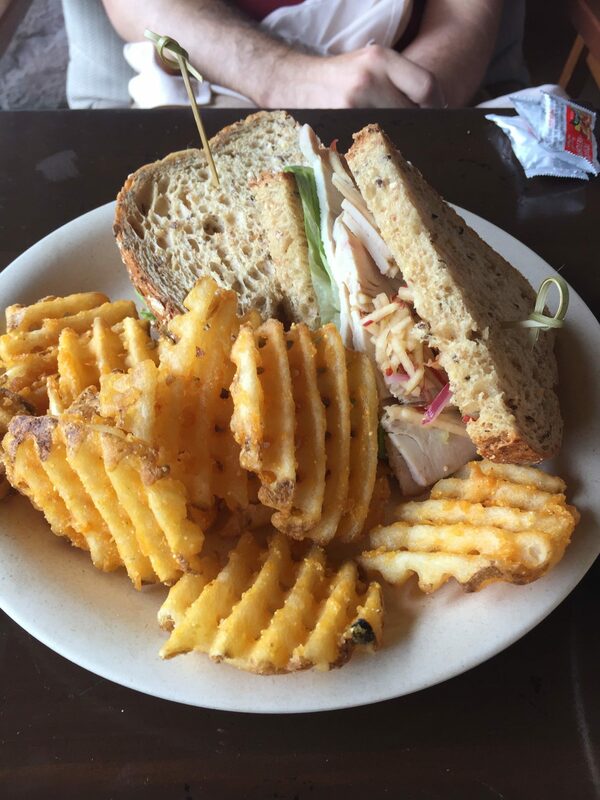 We also tried the Smoked Turkey Sandwich served on multi-gran bread, lettuce, tomato, cranberry mayonnaise, and served with waffle fries. Now I didn’t order a beer or cocktail, so I can’t really speak about their drinks but it does look like they have quite a variety of cocktails and beers to choose from. 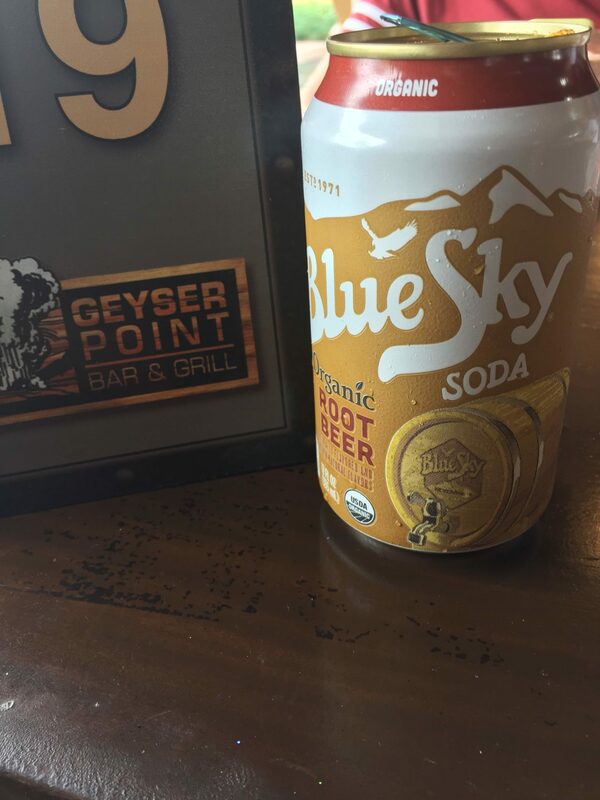 I did order an organic Blue Sky Root Beer which was very good! The food is great and the staff is very friendly and helpful! 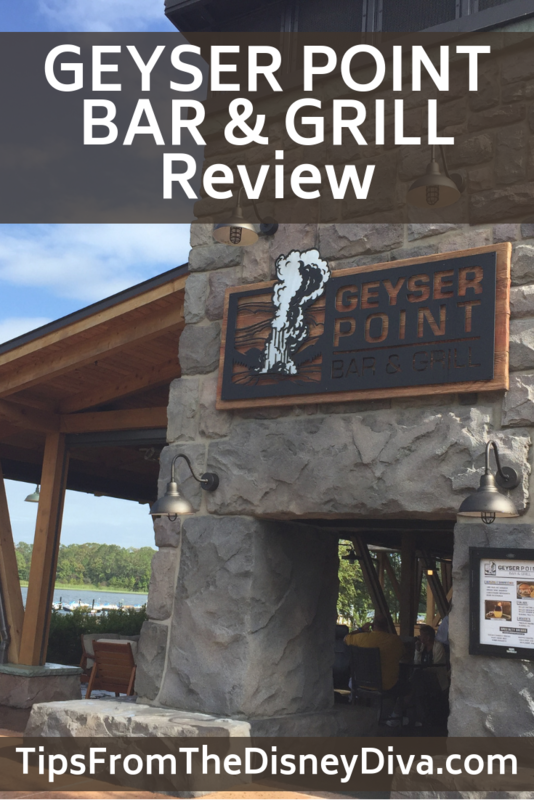 But my favorite part of Geyser Point is the atmosphere! It’s so laid back and is not your typical restaurant; it’s actually more of a lounge. I loved sitting back and enjoying the water and the breeze while eating some really great food! It’s not a large place so if it’s pretty busy, it may be difficult to find seating but there’s several tables as well as seating at the bar. I would shoot for a time that people don’t typically eat lunch or dinner. That’s usually my advise for any restaurant at Disney World. So I have to tell you a funny story. It was a pretty cloudy day when we went, but I love overcast days. We ordered our food and sat down. Then about halfway through our meal, the wind picked up. It became pretty difficult to keep everything from flying off our table. Then out of no where, we got hit with one of those Florida downpours, only this time with the wind as strong as it was, we weren’t going to be able to stay at our table. Everyone had to pick up their stuff and move inward to the bar area. We were soaked! We had a good laugh out of and went on to enjoy our food. So my advise is, unless you want to have a good laugh like we did, I’d make sure you don’t have any strong storms in the forecast. But I’d be lying if I said I wish I hadn’t gone. I’d do it all again… even with the rain! Also at the Wilderness Lodge are the newest Disney Vacation Club Villas – Copper Creek, you can read PIxie Dusted Divas review here. If you’re looking for some help with your next Disney vacation, contact Patricia from All for Dream Travel, the OFFICIAL travel agent of Tips from the Disney Divas & Devos! Get your FREE QUOTE HERE! *Disclaimer – We at Tips from the Disney Divas and Devos hope you enjoy reading our articles, and encourage you to share any you feel may be of interest to someone else. We do ask, however, if you choose to share the photographs attached to our articles, you give credit to the photographer. Thank you for your cooperation and sharing our love of Disney! For as long as I can remember I have been obsessed with all things Disney. My love for Disney started long before our first family vacation to Walt Disney World when I was five years old. However, the obsession began several years later when we visited Disneyland. I love and appreciate the attention to details in everything they do. I love that Disney encourages you to believe in something bigger than you and to have the drive to pursue your dreams for as far as they can take you. In my spare time I enjoy reading, painting, theatre, cooking, gardening, and collecting Disney memorabilia. I live Tennessee with my husband and our Italian Greyhound Jesse.